Head volleyball coach Alan Williams got an indication the weekend was shaping up to be a successful one through a single sign Friday at the Jane Leupold Sweet 16 tournament in Las Cruces: The Bulldogs did well in pool play. Artesia’s struggles in tournament pools, followed by solid play in the brackets, became something of a running joke in 2017, but this year’s netters were able to shake off that stigma in Cruces. Starting out the morning in a pool with Centennial, El Paso Loretto and Deming, then finishing as one of the top seeds in the afternoon pools, the ‘Dogs’ 9-3 record earned them a spot in the Gold Bracket – and, subsequently, a chance to compete against the tourney’s other top teams. 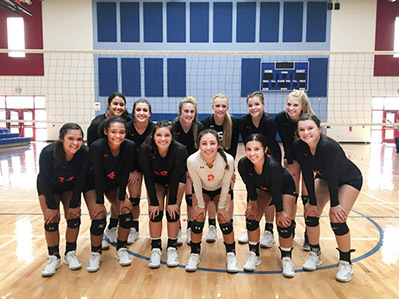 Their first hurdle came Saturday morning against Class 5A Centennial, and despite battling tooth and nail, Artesia came up short in five, sending them to the tournament’s third-place match against a familiar foe: Roswell High. And there, the Bulldogs shook off the fatigue of the marathon two days to top the Coyotes in three straight. “Playing well in pool play got us off to a good start,” Williams said Saturday. “I thought we should’ve won both games against Onate, but it came right after we’d played Las Cruces High, and we put forth a lot of effort in that match. That maybe led to a little bit of a letdown against Onate, and I think the same thing happened today. The Bulldogs and Hawks warred their way through the first two games of their Gold-Bracket-opening match Saturday morning, with Artesia taking the opening bout 25-22 and Centennial the second, 22-25. The ‘Dogs momentarily lost their rhythm in the third set, falling 15-25, but came back with a 25-16 victory in the fourth before falling too far behind in the fifth, 7-15. “We had our chances to win, we just couldn’t come through with it in that fifth game,” said Williams. “We had some errors, things just didn’t go our way, and we ended up dropping that one. Against the Coyotes, the Bulldogs hunkered down and did what they needed to, taking the match by scores of 25-23, 25-19 and 25-19. Malori McSpadden finished as an All-Tournament Team selection for Artesia with seven blocks on the day Saturday. Other Saturday stats included Sadie Ramirez with 45 digs, Paityn Houghtaling with 22 kills, and Kyrah Gonzales with 32 assists. The Bulldogs will now head to Clovis Tuesday for a 7 p.m. rematch with the Wildcats – whom they defeated in three Aug. 30 at Bulldog Pit – before returning home Thursday for yet another rematch, this time against Roswell High.